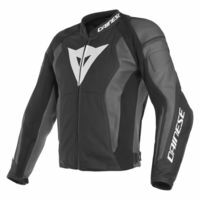 The Dainese Nexus Jacket is the center of new-fashioned motorcycling gear. Modern Dainese design with sporty aggression give the Nexus leather jacket its contemporary look and and feel. Cowhide leather resists abrasion and CE rated armor at the elbows and shoulders absorb impacts. Complete the impact protection by adding optional double chest protectors and a back protector, both sold separately. S1 bielastic fabric makes sure the fit is snug while allowing freedom of movement.